Rhymes With Snitch | Celebrity and Entertainment News | : Kenya Moore Lost Her Peach? Kenya Moore Lost Her Peach? 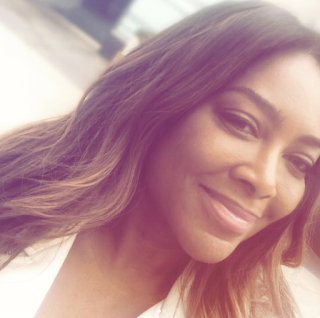 Over the weekend Real Housewives of Atlanta cast-mate Kenya Moore went ballistic over rumors that she was not pregnant, was getting a divorce and had been fired from The Real Housewives of Atlanta [click here if you missed that]. According to reports the cat was let out the bag last week after the RHOA team held the first pre-production meeting for season 11 and Kenya wasn't there. The meetings are mandatory and only cast-mates with contracts are allowed. So who was in attendance? Cynthia Bailey, Nene Leakes, Kandi Burruss and Porsha Williams. New full time cast-mates, including Eva Marcille, are also being considered. Bottom line he signed on for promotion and publicity of the Resturant he just bought. He agreed to be part of HER production company as a cast member playing her husband for a fee ON THE SHOW. Not a Kenya fan, but IF all of those things were not true Bravo would be falling over themselves to get more ratings. There is nothing people enjoy watching more than a person getting the fairytale ending than watching the fairytale fall apart. I call BS. Also, knowing how difficult IVF is for women over 40, let alone 45 the chances of Kenya being pregnant with her own eggs are slim unless she froze and stored them when she was younger. I truly hope this Woman is not that devoid of the truth and that she is holding out for more money. THROW THE WHOLE SHOW INCLUDING RACIST SYMPATHIZER ANDY COHEN IN THE TRASH!! This show is still on the air? Smh. How do they still find material to argue over after a decade of the same quarrels???? This show is garbage now so perhaps this is a blessing! The ratings will definitely drop now if this is true.